This stunning modern ground-floor apartment is furnished in a contemporary style and to a high standard. The apartment is in a superb location, set back from the road in a quiet complex, but very close to a wide selection of local and international restaurants. A sandy blue flag beach is approx 1000m away, approximately a ten-fifteen min walk. The exclusive Royal Seacrest complex benefits from two main pools, with pool showers, plus a children's pool and jacuzzis. New in 2018 is that a pool lifeguard will be provided. The complex has landscaped gardens and on site parking. New for 2015, the apartment features complimentary wifi and UK TV channels and movies. The Paphos area offers a variety of activities from golf (3 courses) to go-karting, relaxing on the beach to skiing or walking in the mountains. Paphos is a world heritage site and contains a wealth of archaeological sites. In 2017 it is also EU Capital of Culture with various activities planned in recognition. The Tomb of the Kings is located across the road, with the main bus route. If you like to be pampered then the 5* Espa spa is at the Elysium hotel. Local Restaurants - Some Examples: Youkoso - Tomb of the Kings Ave (5 minute walk) - Japanese, Sushi, Sashimi and Teppenyaki We have enjoyed a couple of great meals here at the teppenyaki tables! Oliveto - Tomb of the Kings Ave (10 minute walk) - Hot Stone Grill, amazing Argentinian steak and selection of seafood cooked on a hot stone at the table. Great wines too with a really good shop attached. A firm favorite - we make sure we pay a visit every stay! The Pelican - Paphos Harbour (25 minute walk along the new coast path / 5 minute taxi) - good local seafood in a setting where you can watch the boats and the world go by. Epicurian, O'Shins Sushi, Mediterraneo - Elysium Hotel (5 minute walk) - A selection of six restaurants including an open air restaurant overlooking the sea serving fresh fish. Fat Mamas - Tomb of the Kings Ave (5 minute walk) - Italian American Restaurant, huge portions with great friendly service. Royal Seacrest is a secure complex with barrier entry for vehicles (barrier card provided). Communal Sun Loungers and umbrellas are provided by the pools. We can recommend a babysitter if required. Very popular with people coming to Paphos for weddings. We now live in Switzerland with our nine year old son Oliver, and six year old daughter Lucinda, having moved from the UK in 2013. We bought the apartment in 2007, choosing Cyprus for many reasons, not least the 300 days of sunshine a year! We bought the apartment off plan in Royal Seacrest, seeing the plans and an empty field! We knew it would be a great development from the fantastic central location close to the beach and the spec including several pools, children's play area, etc. Its proximity to so many restaurants was also a big factor! We are looking forward to many holidays there, and you will enjoy the apartment too! The apartment is regularly repainted and we have added free 5MB wifi, UK TV including 7 day catchup and free latest movies. Showers and changing rooms are also available by the pools. Jacuzzi and Pools available within Royal Seacrest complex and Spa in neighbouring Elysium Hotel. Free Wifi internet included in the apartment and close to the apartment by the pool. Wii provides with selection of games. Quality Mountain bikes or road bikes (Boardman) available for rent locally (inc variety of pedals, and gear provided etc). Great cycling routes along the coast and into the mountains. Boats can be rented at Paphos harbour. Small step to enter at rear of property. Several steps to front. We have had guests with wheelchair enjoy the property. The apartment is on the ground-floor and has a garden with a gate that can be closed, making it very good for young children. Communal sun loungers and umbrellas are available by the pools. The apartment is wheelchair accessible - there are several steps up to the front door, but only one small step up from the rear, accessed via the terrace from the pool area. Complimentary Starter Pack - includes basic essentials, such as toilet rolls, soap, tea, coffee, sugar, milk sachets, etc, is provided to all our guests. A full welcome pack or special requests (e.g. bread, bacon etc) can be catered for upon request. The apartment has UK 3 pin electrical sockets throughout - so no need to bring adapters! Free Wifi Internet access included for the apartment that stretches to nearby beside the pool. Hire quality road or mountain bikes locally - great base for a cycling holiday. Really enjoyed our short beak away in Paphos. The apartment was clean with all the amenities required and only a short distance to bars, restaurants and shops. Would definitely recommend and would definitely visit again. on arrival everything was clean and tidy. Free Wifi allowed us to replenish our kindle and use the tablet. The air conditioning was a god send as it was so hot even in late September. We never used cooking facilities as we wanted to try a variety of different restaurants. The pool was clean but the lining could do with replacing but this is not to be taken as a negative as it is still usable. Plenty of sunbeds available and the patio furniture in the shade was great for breakfast and when the sun got too hot. The apartment was ideally placed for short walk to Paphos' plentiful bars and restaurants, we would recommend taking a small torch with you as crossing the dirt path coming home after dusk there are no street lights. Fat Mamas was fantastic with singing and dancing by the 3 women a must to watch, the food was fantastic and the Irish bar for its Steak and mushroom pie is a must.The little shop just across the dirt track is handy for milk, Lidl is about a 30-40 minute walk and we found that it wasn't well stocked. the supermarket opposite Tramps restaurant was better. There is a supermarket in the mall and one in Paphos near the bus station. The buses are very reasonable costing 1.50euros where ever you go until 9pm then it becomes 2.50euros, very clean but are extremely busy in daytime. We would recommend getting off the bus at McDonalds drive through as the next bus stop is way passed the apartment. Getting to the harbour was a 20minute walk down the main street,( longer if you stop for a drink at the Brew Dog bar with its variety of cocktails and a board with 4 different ciders to try.) 40 minutes along the beach walkway once there there is plenty to see and do. At the end of stay we contacted the owners to enquire if we could vacate the apartment later than specified we got a postive reply which meant we could take our time with packing and leaving this beautiful island. Thank you and we will return to this beautiful apartment and country. Had a wonderful stay. Apartment was in a great location. The apartment is part of a lovely complex with great pool area. Being on the ground floor was perfect for nipping back into the apartment for drinks and snacks! The apartment was cool and we didn’t need to use the air conditioning as much as we were expecting. The apartment is lovely a spacious. The apartment was within walking distance of bars, resturants and shops. The bus was great for getting to the harbour and Coral Bay. Just a couple of suggestions to improve the apartment even more. firstly, having a small table and chairs to eat inside would have been great, as eating outside was fine in the evenings, but during the day it was too hot!! Also would have been nice to have a small table in the master bedroom in front of the mirror to do hair and make up!! Overall a fantastic apartment. Thank you. I would just like to thank Simon and Rachel for a fabulous stay in their apartment. We travelled with four boys aged 12, 10, 2 and 9 months and can honestly say we were all catered for perfectly. We were able to sit and and relax as the children played in the pools which were spotlessly clean and safe. The complex was maintained by a team who cleaned the pool, bathing area and gardens daily. The boys loved the big tanker that arrived weekly to replenish the freshwater in the pool. There was also an ice-cream van that frequented daily. I was worried that this place would be too quiet for us as a family (especially that we have been to bigger family hotels before) but was pleasantly surprised. Everybody was so friendly (holidayers and residents) giving us tips as to where to eat out and explore locally. The children made many friends and were able to use the facilities to play and have fun all day! 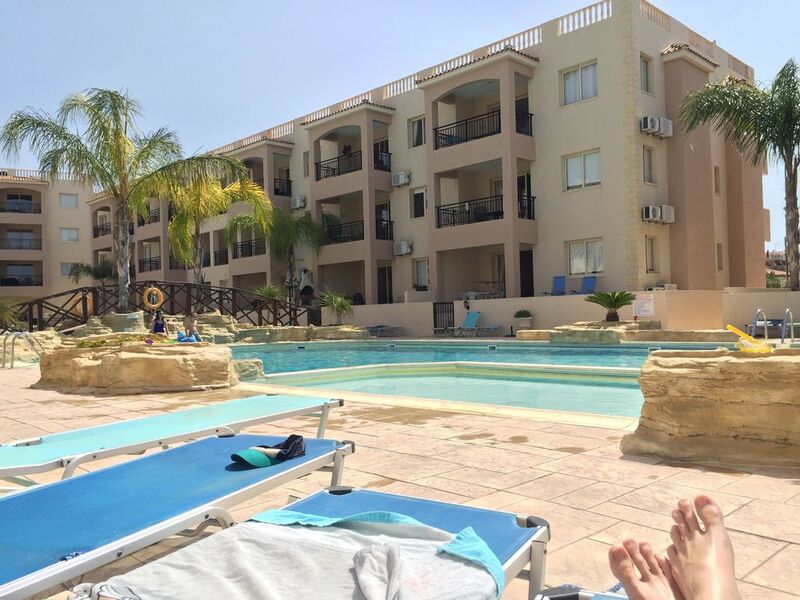 The apartment is in prime secure position being right next to the children's area of the pool on the ground floor with ample terrace and surrounding sunbathing areas. The apartment was kitted out with everything you needed to have a seamless holiday. The housekeeper Ann was also on call 24/7 if there were any problems with the apartment. Rachel was also on hand via email for any other queries and was prompt with responding from the first day we booked to our return home. The apartment is in such a perfect location to walk to Tomb of the Kings, Paphos harbour, old town, Kings Mall, and local restaurant and bars. A short taxi or bus ride also took you to Coral Bay beach and neighbouring waterparks which were reasonably priced. We stayed for 10 nights but would have easily have stayed longer as this was a lovely relaxing family holiday in a fabulous complex. We don't normally like visiting the same place twice but for convenience, location and lavish lodgings we would definitely go back next year!! The apartment is situated in a secluded area between the Tombs of the Kings and Kato Paphos less than 1000m the sea. Well located, it is in a quiet spot yet only a few minutes walk to numerous bars and restaurants and to the sandy public beach. It is also only 800m from the 5* Elysium Hotel offering high quality Spa facilities and further leading restaurants. The harbor area, with its numerous seafood restaurants, is a pleasant 20-30 minute walk along the coast path and you can reach the old town within 10 minutes. Ancient Roman and Greek sites are plentiful around Paphos these include the Tomb of the Kings (5 min walk), the harbor area and the World Heritage site that houses the famous mosaics. Paphos has two Blueflag sandy beaches and water sports, including paragliding, windsurfing and jet skis are widely available on most beaches in Paphos and the surrounding areas. The best sandy beach can be found at Coral Bay, a short drive along the coast. The new Kings Avenue Mall has now opened on Tomb of the Kings road offering a variety of leading name shops and restaurants, and a cinema. It is within walking distance, or 5 minutes in the car with ample parking. For extras such as cot / high chair, or early / late check-in please contact us.